Did you know that Coconut Oil is one of the best natural substances you can apply to your face and body? It's one of the healthiest oils in the world and can be used in cooking and topically for your face, body and hair. It's truly an amazing health and beauty multi-tasker and it's a natural product I won't be without! The amazing benefits of Coconut Oil can be attributed to lauric acid, capric acid and caprylic acid which are antimicrobial, antioxidant, antifungal, antibacterial, and soothing. There are many benefits for the skin including plumping and delaying wrinkles and sagging of skin, treating various skin problems including psoriasis, dermatitis, eczema and other skin infections. It's also non-comedogenic so it won't clog pores and you can feel good about using it as a daily facial and body moisturizer. You can even use it on a breakout without causing further eruptions. It melts in your hand so just apply as you would with your usual facial moisturizer and body lotion until absorbed. 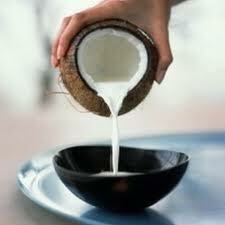 Make sure you're using Virigin Coconut Oil, otherwise it will loose all it's nutrients during processing. Use for a few days and your skin will be beautiful, glowing and baby soft!. You can learn more about the amazing benefits of Coconut Oil in my blog post: The Amazing Benefits of Coconut Oil.